Globalization and the increasing interconnectedness between people has always proven to be a major boon for businesses looking to grow profits. 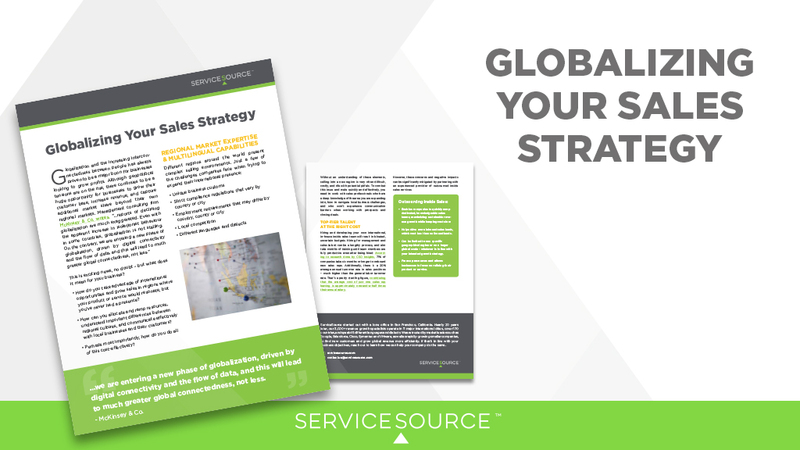 Although geopolitical tensions are on the rise, there continues to be a huge opportunity for businesses to grow their customer base, increase revenue, and capture additional market share beyond their own regional markets with outsourced inside sales. Management consulting firm McKinsey & Co. writes, “…reports of declining globalization are much exaggerated. Even with the apparent increase in isolationist behaviour in some countries, globalisation is not stalling. On the contrary, we are entering a new phase of globalisation, driven by digital connectivity and the flow of data, and this will lead to much greater global connectedness, not less.” This is exciting news, no doubt – but what does it mean for your business? How do you take advantage of international opportunities and grow sales in regions where your product or service would resonate, but you’ve never had a presence? How can you allocate and ramp resources, understand important differences between regional cultures, and communicate effectively with local businesses and their customers? Perhaps most importantly, how do you do all of this cost-effectively? “…we are entering a new phase of globalization, driven by digital connectivity and the flow of data, and this will lead to much greater global connectedness, not less.” – McKinsey & Co. Without an understanding of these elements, selling into a new region is very often difficult, costly, and rife with potential pitfalls. To combat this issue and scale quickly and effectively, you need to work with outsourced inside sales professionals who have a deep knowledge of the area you are expanding into, how to navigate local business challenges, and who won’t experience communication barriers when working with prospects and closing deals. Hiring and developing your own international, in-house inside sales team will result in bloated, uncertain budgets. Hiring for management and sales talent can be a lengthy process, and also take months of training until team members are fully productive even after being hired. According to research done by CSO Insights, 71% of companies take six months or longer to onboard new sales reps. Additionally, there is a 20% average annual turnover rate in sales positions – much higher than the general labor turnover rate. That’s a pretty startling figure, considering that the average cost of just one sales rep leaving is approximately one-and-a-half times their annual salary. However, these concerns and negative impacts can be significantly mitigated by partnering with an experienced provider of outsourced inside sales services. Enables companies to quickly ramp dedicated, knowledgeable sales teams, maximizing sustainable revenue growth while keeping costs low. Helps drive more inbound sales leads, which cost less than outbound leads. Can be limited to one specific geographical region or on a larger global scale – whatever is in line with your intended growth strategy. Frees up resources and allows businesses to focus on refining their product or service.